I finally took up the challenge, all in the hopes of resolving a challenging situation that has plagued me for years. 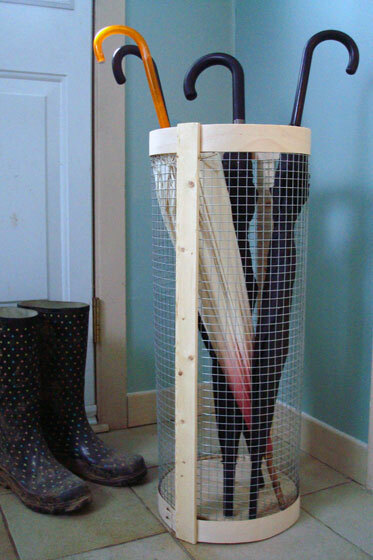 I’m speaking of course of the Pinterest Challenge and umbrella storage–life changing, I know. My (p)inspiration was Karen’s Country Living-inspired basket. Karen posted a great tutorial on her blog, The Art of Doing Stuff, back in the summer that I pinned right away with exactly this project in mind. I used a few different materials (no peach basket) and changed up the assembly a little bit, but the end result is the same–a rustic, stylish and super functional basket. Perfect for wrangling all of our unruly umbrellas. The materials: sturdy wooden board, wire mesh, veneer, wire and wood strips. The tools: sander, jigsaw, staple gun, snips, tape measure. 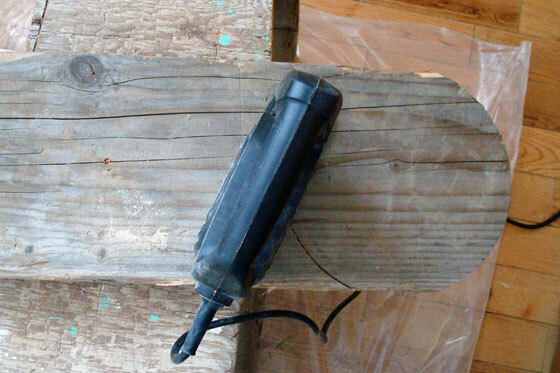 Absent from this shot is a sharp utility knife, a metal ruler or straight-edge of some kind and a glue gun. I chose a sturdy piece of wood for the base, as I wanted the stand to have some weight so that it would not tip over once it was full of umbrellas. Instead of a peach basket, I used a roll of veneer. The strips are the spacers that are used in big skids of lumber. That woman in a business suit and heels you saw last week at Home Depot crawling around, stretching to reach under the stacks of lumber? Yeah, that was me. It’s hard to find strips that are long enough as most of them get snapped as people go through the piles, but they were the perfect rough texture for my basket, and best of all they were free. First step was to make the base. I used a plate as my pattern and cut the circle with my jigsaw. A few passes with my sander smoothed out the edges and took off the weathered grey outer layer–I wanted a natural wood finish for my basket. 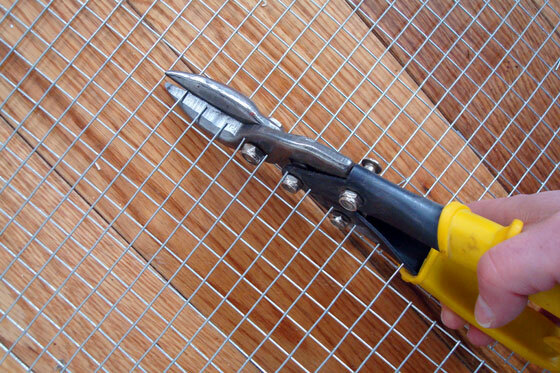 I rolled the base in the wire to figure out how long to cut the mesh–very scientific measuring method, I know–and nipped it across with my snips. 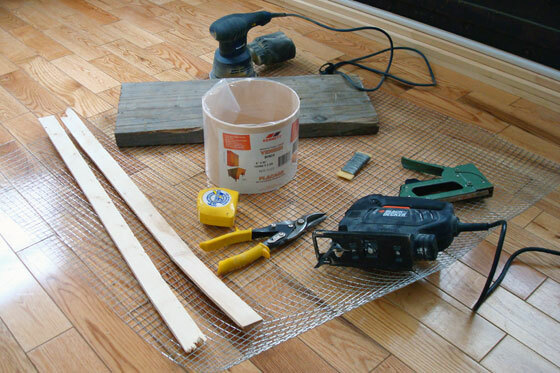 To form the mesh into a cylinder, Karen showed two options in her post: green wire and twine. I chose a fine silver wire that I already had on hand and wound it through each square. It blends in with the mesh perfectly. 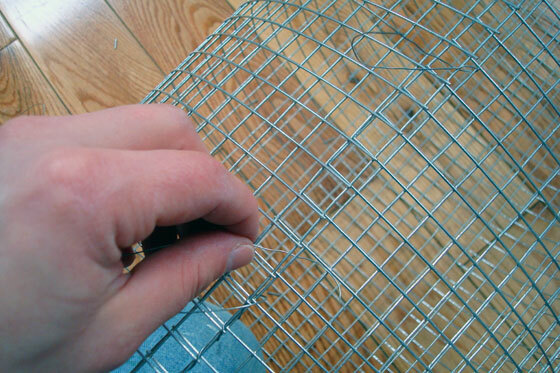 To deal with the springiness of the mesh, it’s helpful to “tack” it in a few spots with small lengths of wire. My wire tube was pretty good looking, but to make it a functional umbrella stand, it needed a base. 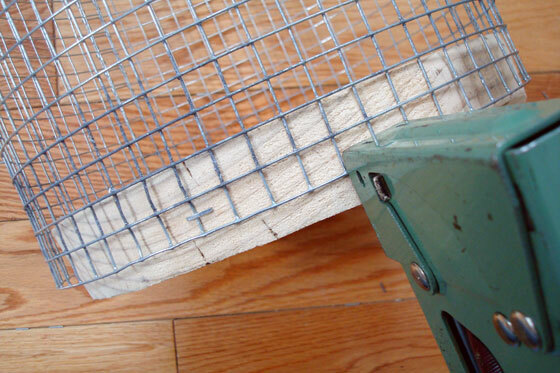 I slid the wood disc into the mesh, lined it up along one of the rows of wire and stapled it in place. Now for the finishing touches. To cover up the staples, the raw edge of the base and the end of the mesh, I went to my roll of veneer. The veneer was about 6 inches wide, but I only needed strips that were 1 1/2 inches. 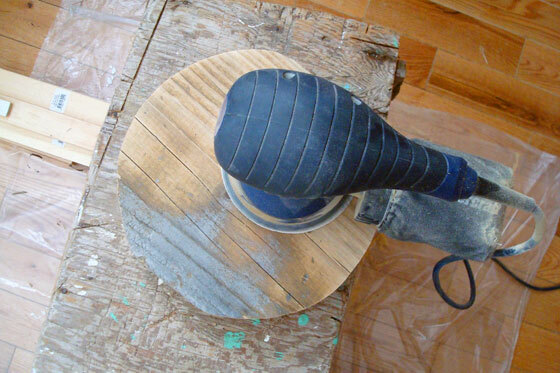 This is where a good straight-edge and a sharp knife came in handy. 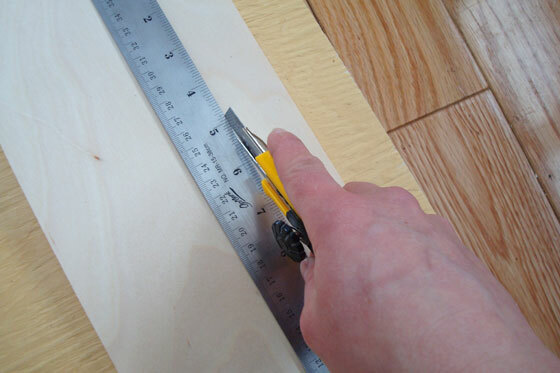 I measured off my strips and then scored the veneer along the edge of my ruler. The veneer was very thin, so the knife cut through it easily. The only challenge was that the knife wanted to follow the grain of the wood rather than the straight edge, so I had to make sure to keep the knife snug to the side of the ruler as I was cutting. I had planned to tack the veneer to the basket with a couple of staples or small nails–I figured those would be in keeping with the rustic aesthetic I was going for. It turned out though that the veneer was pretty fragile. It cracked as soon as it was pierced. I returned to Karen’s tutorial and decided a glue gun was the way to go. However, out of all of the tools that I own, a glue gun was not one of them, so the project was delayed until I could borrow a glue gun from my Mom. Turns out she had an extra from my grandmother that now belongs to me. Who knew Grandma was so crafty? A bunch of daubs of glue around the base attached the veneer to the bottom of the stand. At the top, I sandwiched the mesh between two more strips of veneer and stuck them together with more glue. My edge turned out fairly tidy, so I didn’t apply twine like Karen did. 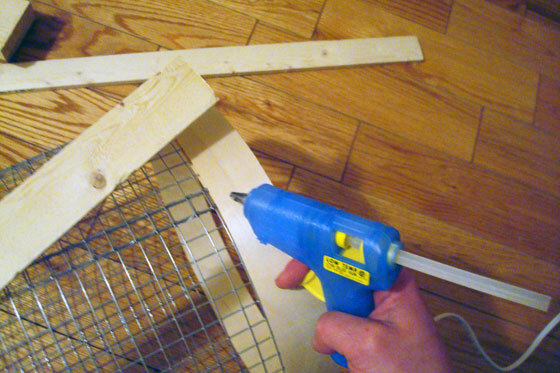 A couple quick nips with my jigsaw cut two of the lumber yard strips to the right length, and four more daubs of glue had them attached to my basket. Sorry for the poor image quality. The sun had set by the time I got to the glue gun stage. I had forgotten how easy it is to work with a glue gun. It held all of the wood in place really securely and the glue set up really quickly. 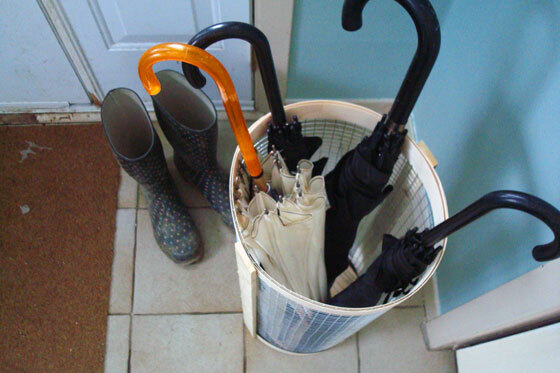 In no time, I was able to transfer my finished basket to the mudroom and fill it with umbrellas. We do not do cute shiny rubber boots here. They started out cute and colourful, but they are now very muddy. The basket is perfect. Exactly the right rustic style, and exactly the right size (9 inches in diameter and 25 1/2 inches high, in case anyone is wondering). It easily fits our four umbrellas and could probably handle a couple more. I am quite excited to finally have a place to put them and to no longer have to deal with them flopping out of the closet at me. In fact, every time I walk past the mudroom now, I switch on the light just to look my new umbrella stand sitting tidily in the corner. Yep, I’m a little weird. Now we just have to finish off the rest of the mudroom. We painted the walls on the weekend, but I still need to tackle the trim (currently painted a flesh-tone, ugh), fit out the closet, refinish the closet doors and build a bench. Right now, the umbrella stand is the best thing in there! Are there any other Pinterest addicts out there? You can see all of my boards, including the mudroom one, here. Have you been inspired to make anything from Pinterest or participated in the Pinterest Challenge? You can check out all of the projects on Sherry’s, Katie’s, Megan’s and Michelle’s blogs. Anyone else have a crafty grandma–or are you a crafty grandma yourself? Does anyone else find umbrellas hard to store? This is fantastic! Perfect for function and looks so cute! Thanks so much. I happen to agree! Looks great! I love The Art of Doing Stuff! Thanks, Sarah. The Art of Doing Stuff is the best of both worlds: educational and hilarious! That looks unbelievably amazing! My Mom would call it “rustic chic” and it is the highest compliment you could get from her! Thanks, Stacey. Since moving to the country, I’m trying to figure out how to balance my house’s need for rustic with my need for chic! Oh my gosh, what a cool idea! I am loving this!!! Thanks so much, Megan! I managed to get it done, just in time! Don’t you love it when you can meet a specific need – yourself – and for very little? I get quite a disproportionate amount of pleasure when I pull that off! “Electronic hoarder” 🙂 It looks like you’ve been doing really well with your projects. Pinterest is great for inspiration, but I really like actually doing things more.